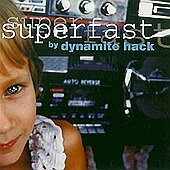 Typical, overly produced modern rock without any flaws except generic songwriting and the fact that the band tried so hard to eliminate all the flaws, Dynamite Hack still seems to sparkle at times despite everything weighing against them. "Dear Kate" is a charged, energetic, controlled pop-punk burst of humor and hooks, while "Boyz-n-the-Hood" showcases the band's ability to play up the humor of white homies with a sugar pop, highly-infectious backdrop that will no doubt find you snagged on every word. The rest of the material, however, is so average harder-edged modern rock that it is barely listen-able. If you want modern rock that sounds like everything else, why buy CD's? Listen to the radio. I'll give this a D+.